iPhone Xs And Samsung Galaxy S9: What Are Differences? Unlike the Galaxy S9 and S9+ models, which only came with modest improvements, Apple has made big internal upgrades with its new iPhone Xs and Xs Max. Although the iPhone XS looks similar to its predecessor, the last-year iPhone X, it’s significantly faster and packs a number of new technology. Let’s now see how it compares to one of the best Android smartphone, Galaxy S9. iPhone Xs features a 5.8-inch True Tone OLED with a resolution of 2436 x 1125 pixels, 3D Touch, HDR10, and Dolby Vision. Both the phones feature cutting-edge OLED panels, which currently are the best in the market. Irrespective of which phone you choose, you simply cannot have any complaints about their displays. While the Galaxy S9 is thicker and taller than the iPhone Xs, thanks to its curved OLED display, it makes sure that the phone is not as wide. Both the phones are covered with a glass on the front and back, but the iPhone Xs takes advantage of a stainless steel chassis, which is much more premium to touch over the aluminum chassis of the Galaxy S9 device. They also come with the IP68 certificate for water and dust resistance, though the IP certification on iPhone Xs is slightly better. iPhone Xs is equipped a 7nm- A12 Bionic chip, 6-core CPU which is 15% faster, 50% faster 4-core GPU, and 8-core Neural engine. Galaxy S9 is running on Octa-core Exynos 9810/Snapdragon 845 chipset, clocked at running at 2.7/2.8GHz, based on 10nm process. The Galaxy S9 is powered by Qualcomm’s Snapdragon 845/Exynos 9810 chipset which are currently the fastest chipset you can find in the Android ecosystem. But none of them can be against Apple’s A12 Bionic, which is an extremely terrible monster in the performance department. The A12 Bionic chip integrated into the iPhone Xs is at the absolute bleeding edge of the technology with an 8-core Neural engine, based on 7nm process, as well as 6-core CPU. The Samsung Galaxy S9 is nowhere close to what Apple offers for its iPhone Xs. It is really a powerful chipset, allowing Apple to provide many intuitive new features on the iPhone Xs. iPhone Xs features a dual 12MP camera setup on the back. The first sensor comes with a f/1.8 aperture while the second one features a f/2.4 aperture. Both sensors come with OIS, Smart HDR, Focus Pixels, as well as Portrait mode, featuring advanced bokeh and Depth control. Galaxy S9 is equipped a single 12MP camera with variable f/1.5 and f/2.4 aperture, which also comes with OIS, Auto HDR, Speed Dual Pixel, Live Focus with bokeh effect adjustment. The camera specs of both handsets are basically the same on paper. The main sensor of the Galaxy S9 comes with an advantage because of its variable aperture, that has a wide f/1.5 aperture for taking pictures in low-light condition. But thanks to Apple powerful ISP and algorithms, the iPhone Xs can extract better performance from its sensors. With the HDR 10 feature, the iPhone Xs can capture more details of the objects and offer a better dynamic range. As they are flagships, both phones also offer depth control for portrait mode, though there are more features on the new iPhone Xs. According to Apple, the iPhone Xs can shoot videos better over the Galaxy Note 9, thanks to stereo sound recording support. iPhone Xs will be able to last 30 minutes longer than its predecessor, the iPhone X, wireless Qi charging. In this era, the iPhone Xs completely destroy the Galaxy S9. With the combination of a 7nm chipset, optimized software, and hardware equipment, the iPhone Xs will deliver a significantly better battery life than the Galaxy S9 phone. The era that the Samsung S9 can beat the iPhone Xs is with charging. Even despite being equipped a slower wired charging (15W), Samsung bundles a 15W adapter with its flagship. On the other hand, Apple still bundles a measly 5W charger in the box of iPhone Xs, although the phone now supports 18W fast charging. It means the Galaxy S9 will charge faster over iPhone Xs when both phones are charged with their bundled charger. While the standard variant of both phones has a similar 64GB internal storage, Apple offers a 256GB storage variant of iPhone Xs. For the Xs Max model, this figure is even up to 512GB. 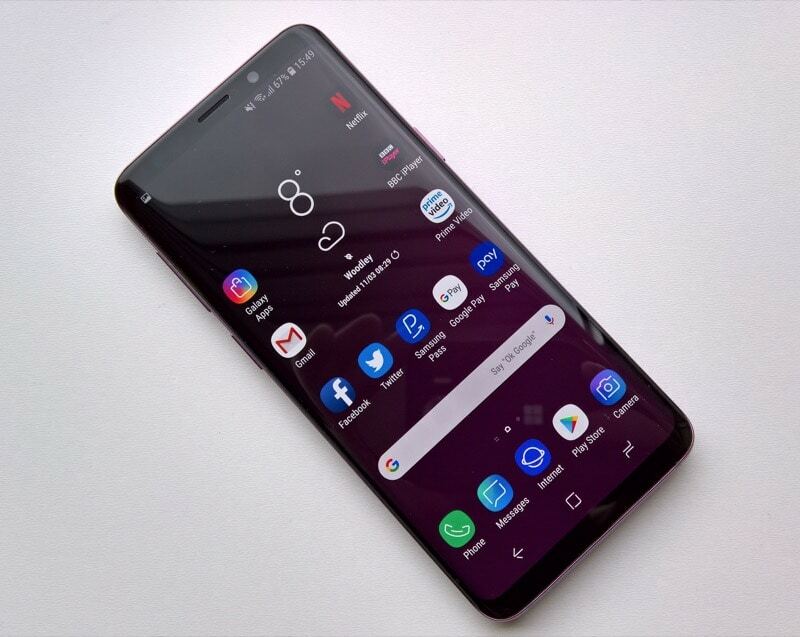 The 512GB Galaxy S9 version is only available in certain markets, though the phone supports a microSD card slot to expand storage for cheaper price anytime you want. The iPhone Xs, and Galaxy S9 altogether packs with 4GB RAM. Galaxy S9 comes with the Iris scanner, Face unlock, Fingerprint scanner. Unlike the iPhone Xs which is only equipped a form of biometric authentication, the Galaxy S9 offers three different types of authentication for users, including a fingerprint reader. The Galaxy S9 is now nearly six months old, which means you can easily grab a Galaxy S9 for a lower price than their official retail price. However, Apple is not known for offering any kind of discounts for its devices even when they are released for a few months. With the starting price tag at $999, the iPhone Xs are extremely expensive smartphones to purchase. The Galaxy S9 and the iPhone Xs obviously differ from each other in terms of software. If you don’t like Android, the iPhone Xs should be your choice, while the same stands true for the iPhone Xs as well if iOS platform is not your liking.